With tender skins and waxy, delicately flavoured flesh, these little slow-grown spuds are spot on for salads. Boil and anoint with melting butter, a scrunch of salt and fresh shredded mint. Or mix with creamy mayonnaise, chives and onions – adding bacon, smoked fish or boiled eggs to make it a substantial meal. When you tire of buttery, minty potatoes (if that’s even possible), branch out. Eat boiled potatoes in a classic mayonnaise and chive salad. Or toss with a bouquet of seasonal veg – in spring, try broad beans, artichoke hearts and wet garlic. Salad potatoes also roast well, especially with a few sprigs of rosemary and cloves of garlic. Delivered from our farm, so wash before cooking. Try to eat new potatoes as soon as possible, they don't store as long as maincrop varieties. 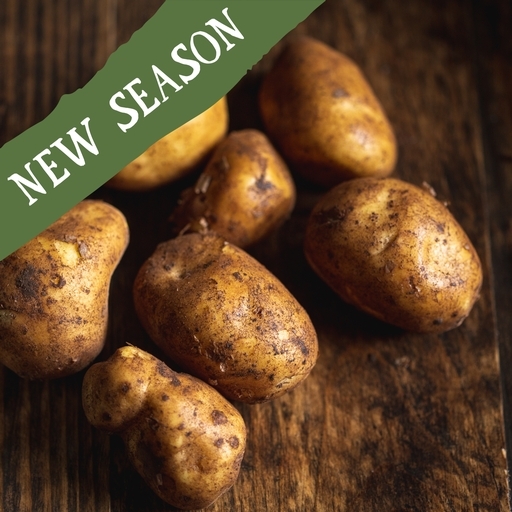 Our favourite Charlotte or Alexia potatoes are in the boxes and bags in July and August, Milva occasionally between October and January.